...aside from actual noise, THAT I don't enjoy so much. :) And unfortunately, Anne's volume seems permanently set to "Deafening" by some nefarious hand these days. I took her shopping with me last night to get some linens for her new bed and her high-pitched little voice just positively RANG throughout the store. Of course, it didn't help that I took her to Mrs. Fields prior to this, hence she was on a total sugar high, so I suppose this was all my fault on this particular occasion. Alas. She's cute, I love to spoil her. We even thoughtfully packaged up one of the sugar bombs to go and bring home to Henry so that he could experience the joy later on, right before bed. Mother of the Year, right over here. "Why is he doing that, Mommy? Is he the murderer? But what about that other guy? Does Columbo know it's him? I mean, he doesn't seem to really know anything. But I like his dog. Is that a clue? What's that he said?" I have one gold costume that was not made correctly, and the results have made me nervous ever since. The darn thing was so *heavy*, and when you dance, you know...you don't want gravity choosing to creep into your life and teach you a lesson right at that exact moment, know what I'm sayin'? And it just never fit me correctly. So I cut the heavy fabric off of the belt, which I never liked anyway. Let me tell you, taking scissors to fabric that you truly despise is the most freeing feeling in the world. I ordered a new skirt, which is guaranteed to actually fit me in hip and length measurements since it's custom cut. So once that arrives I can wear the newly freed belt over top of the new skirt. Shazzam! But the belt was also problematic. 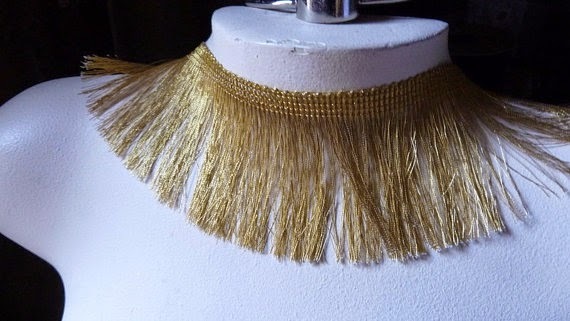 It had gold beaded fringe hanging from it, very pretty, but the fringe was missing in spots. Ugh. I made it my mission to patch in new fringe. "Are you a belly dancer?" It's not as long as the other fringe on my belt, but it'll do just fine. At least now there aren't bald spots in the fringe. I sewed it in last night, and I'm feeling mighty proud of myself and my new amateur sewing ways. I meant to take a photo of the belt, but as we are all so painfully aware these days, I *forgot*. I promise to include a photo in 7 Quick Takes this Friday. That finished, I pulled out another in-progress item in my basket, which is a colorful pair of socks for Henry that he requested for Christmas. Henry, always a soul dear to my heart, likes very bright and bold colors. And, precious child that he is, he always wears the socks that I knit for him and proclaims them his very favorites. This is Frolicking Feet sock yarn (divine) in a colorway called "Confetti." I think that he will love it. 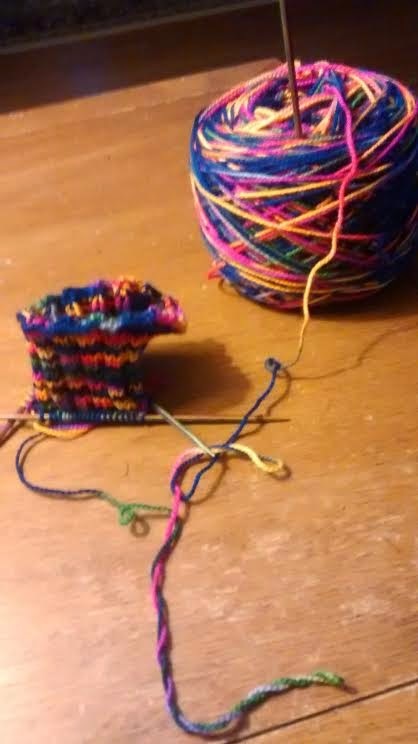 :0 Working on the cuff of sock #1, we're getting there! Hope that you are all having a wonderful Tuesday. :) What's new with you?! Leave me a comment!